Delivering maximum penetration for a significantly better catch ratio, the Lazer Trokar TK100 HD Worm Hooks are heavy duty round bend hooks perfect for rigging worms and soft plastics that will make all other round bend hooks quake with fear. 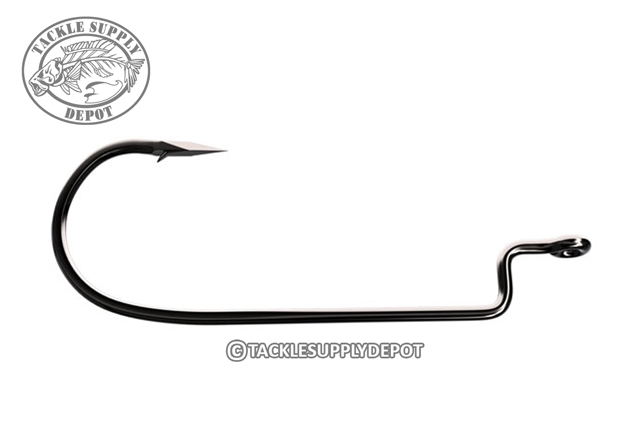 The Lazer Trokar TK100 HD Worm Hooks feature Trokar's unique surgically sharpened three-sided hook points - making them twice as sharp as any other hook on the market requiring half the pressure for penetration compared to others on the market. This patent-pending process precisely grinds the three sides of the hook point using a high-speed, computerized grinder designed for surgical needles. Lazer Trokar also determined the precise angle of the Low-Profile Barb using highly specific geometric calculations to provide easier penetration and the ultimate in holding power. In addition, Trokar bolstered the wire diameter of the hook and used a unique tempering process, specifically tailored to bring out the maximum strength potential of the ultra-high carbon steel Q741 wire. The result is a stouter hook that allows for aggressive hook-sets and intense fights, as well as, just the right amount of flex to resist breaking.